We have a lot to learn still, and we tend to learn things the hard way (i.e. through failure and crushing disappointment), but there are a lot of books that have helped us along the way. I thought I’d write about a few if them once in a while. 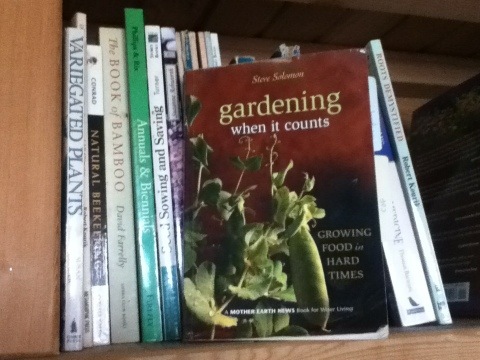 Gardening When it Counts is a book by Steve Solomon, the founder of Territorial Seeds (he sold the business ages ago). What I love about it is that he is all about how simple good gardening can be. Gardening organically may feel like a harder path to choose, particularly when there are folks nearby who have lush jungles in their veg patches thanks to what around here is called “sugar fertilizer” (because it’s granular). So for me it’s really important to know why I’m doing it. Yes, I want to feed my family healthy stuff and I have a gut reaction against chemical concoctions. But what it’s really about for me is soil. A governing concern of mine that I return to when I make decisions about the garden is, “Will it build our soil?” We aim to leave the garden better than we found it, so we’re doing it from the ground up, so to speak. Chemical fertilizers might be a shot in the arm for plants, but they do nothing for the soil. That’s why I don’t use them. However, fertilizer is indisputably useful. I believe that I’d you want a lot out of your soil, you should probably be giving something back. We use manure and compost, but we also Solomon’s COF- complete organic fertilizer. Actually, the formula is available in this article from Mother Earth News. You can make it at home, and the stuff you need us easy to find. I think it works. Basically, this book is about shooting down your excuses. You don’t have tools? Solomon says all you need is a hoe, a shovel, and a rake. Your summers are dry? Space your plants farther apart. Everyone says to do it this way? Don’t listen. Now, we have stony soil so we dig holes with a pick, and sometimes I am too greedy to follow Solomon’s advice about plant spacing. Still, I count this book as one of my favorites and turn to it often.